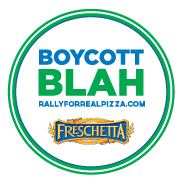 The makers of FRESCHETTA® products are asking fans to take a stand for FRESCH®pizza! Fans are able to submit a photo to a Rally Mosaic on our Facebook Fan Page for a chance to win FRESCHETTA® pizza. Each week, we will select 100 winners to receive 5FRESCHETTA® pizzas. On March 30, we will select 10 winners who will receive a year supply of FRESCHETTA® pizza. Join them for a #PizzaRally Live Event from 7-9pm! Tweet along for a chance to win one of 35 prizes! Make sure you check out the details and official rules on their Facebook page!